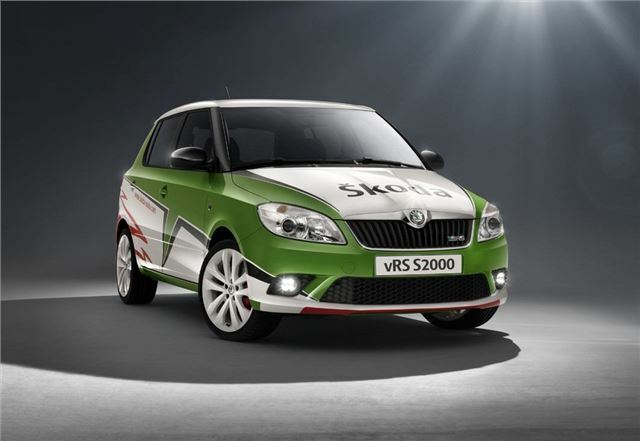 Skoda is launching a special edition Fabia vRS S2000 to commemorate the all-conquering Fabia S2000 which helped the brand to take the IRC Constructors' Champion title, following a successful assault in the Intercontinental Rally Challenge this year. The special edition model is fitted with a 1.4 TSI 180bhp turbocharged and supercharged engine, which provides a 0-62mph time of 7.3 seconds and a top speed of 139mph. The engine is mated to a seven-speed DSG twin-clutch gearbox which can operate in two modes - fully automated and manual Tiptronic. Production is limited to only 200 vehicles worldwide with 20 cars allocated for the UK. Offered in Rallye Green, with a white roof, white 17-inch ‘Gigaro' alloy wheels and race livery - similar to those which adorn the IRC championship winning Fabia S2000, it's not for the shy or retiring types. Skoda took part in 11 of this year's 12 IRC events and celebrated victory at seven of them. Besides these wins, Skoda crews achieved a further 17 podium positions. The Fabia vRS S2000 arrives in the UK in January 2011 with prices set to be finalised shortly.